The True Grit Café opened on New Year’s Eve in 1985 and was built to honor the filming of the Academy Award winning movie “True Grit” starring John Wayne. The movie was filmed in 1968 in and around Ridgway and Ouray. The internal south wall of the True Grit Cafe was the original external wall of “Chambers Grocery” from one of the first scenes in the movie. 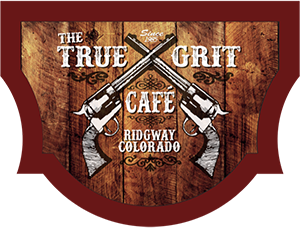 The enduring popularity of the movie brings visitors from all over the world to eat at the True Grit Cafe. Come in to the Cafe and you’ll see a lot of pictures of the great star’s film legacy all around. We specialize in ‘Cowboy Cuisine” serving more than 20,000 Burgers a year and over 5,000 Chicken-Fried Steaks – a locals’ favorite (all hand cut, tenderized 7 times and breaded to order). We focus on quality products – only all natural, nitrate free deli meats, locally sourced pork from Montrose, 30% of our beef is raised by us with a 2 year goal to supply most of it, and all of our eggs are locally sourced. You will get a true “Ranch to Fork” experience when you eat at the Grit! We pride ourselves on creating a place that’s ‘home’ to our locals and visitors alike. We love cooking for our own families, so we want you to feel welcome and included into our family when you step through our front door. We love our community as well and give back as much as we can. We actively support the Ouray County Rodeo, Cattleman’s Association, school sports, Ridgway Chamber, Weehawken Arts, and many other things.